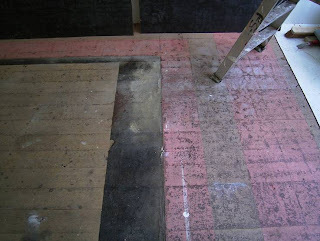 Refurbishment- what is going on in PS²: the floorboards ripped up, exposed rafters, sawdust, the usual mess if you have builders in. At a closer look, the destruction happens quite orderly: the floor panels are carefully placed against the white walls, the floor layers are exposed in sections. The work of a specialist firm of building conservationist or archeologists? Joanna Karolini, who works in film and installation, is the fourth artist in the series ‘sounding out space’, a multidisciplinary exploration of the 23sqm PS² space. In ‘Unprivileged Highs and Lows’, she investigates with a historic and artistic curiosity, what’s underneath the floor of the art space. She peels off the layers and uncovers materials placed upon each other, serving different functions and tastes of a building dating back to 1870. These traces do not only excite your own imagination of people and the use of the space in the past, this site specific project exposes a material beauty which refers back to the current use of the space for art. This is the 4th in the series of ‘sounding out space', a series of explorative projects around aspects of space (architectural, emotional, historical, practical…). The 23m² of project space with its public exposure to the street is the object of investigation with a wide range of multidisciplinary approaches; artists, musician, choreographer, a cat, interior designer, spiritualistic medium, refurbishment people, tenants... All projects are recorded and documented by Fiona Larkin.